Memories of what happened 100 years in the past flood links mind as he pulls the master sword out from its resting place. Just some fun art I wanted to do in celebration of the new legend of zelda coming out soon. . Took about 4 hours or so, speed art. Wow only 4hours that gad damn fantastic for 4 hours. It’s sooooo nice and colorful! Looks like a movie poster concept. Lovebit. Great picture! The lighting and lines add depth and power to the moment! Love the emotion that this piece gives. Excellent work my friend. Keep it up. Man, you captured the moment perfectly. Hey dude...someone has stolen your art and is currently selling it as their own. I see. Damn. Seems like you're not the only one who knows this page. I want to buy this. How can I pay you to obtain a poster of this Masterpiece? I really hope it's not scam. Without them telling us they didn't give permission we'll never know. Cause who knows maybe they did. 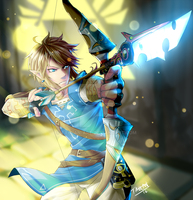 This is one of the best drawings i've seen from Breath of the Wild! Amazing!